Crossfade is new to Captain Cynic and has less than 15 posts. New members have certain restrictions and must fill in CAPTCHAs to use various parts of the site. I had some thoughts today on the horrifying shooting in CT and on how these shootings keep increasing everyday. I came to a very scary conclusion about my generation and was wondering if anyone else had thoughts on this. My conclusion was that my generation (18 - 25 yrs of age) is going to have the biggest culture shock of their lives when they grow up and confront reality. This is also why I'm tying the thought into the recent shooting. Did you notice that both the aurora and CT shooters were young kids that couldn't handle life. Also, they choose to take their suicidal attempts out on society. Hmm, there might be some patterns here. Imagine when these worlds collapse because they hold no weight in real life. We haven't drawn a distinction to what is only a fantasy and what holds true everyday. .....So a lot of people grew up thinking their lives would turn out like Disney movies and the shows we watch on TV. We grew up thinking that the world is a happy go lucky place and there's nothing to be afraid of etc etc. We all live our lives in accordance to what we know, am I correct? These cultural influences are known to have more of an influence than say logic. What we were taught in schools has very little to do with being successful in real life. We missed out on important life lessons and instead took an academic approach. All the time wasted to learn extra BS just to pass a test.. for what? All of this was for a job? 22 years and all you could prepare us for was an entry level job that we could've done around the age of 10? Did we need five years of spanish.. did we need calculus III??? We're using our national resources poorly and wasting away our valuable time in life. Not to mention the outdated ways of learning: sitting in a classroom, not talking, staring ahead while the instructors drone on about nothing. This doesn't set us up for success, rather it takes away our natural curiosity and "learning" now becomes a chore. Now most people want to stop learning when they get out of school. Learning and experiencing is a life time process. Also in school, we learn about math, english, history, and a number of other limited subject areas, but we ignore so many other important lessons. What about hands on application or socializing and working in groups. Outside of the typical pencil pushing note taking, I rarely saw any of this. What about making tough life decisions? Using leadership instead of sitting there being spoon fed information..
We have gone too far being politically correct and kids are not receiving attention. They are treated like a checklist. Did you do your homework.. check. Did you do your chores.. check. Are they a good kid.. check. Now that they are everything that society tells me they should be, here's a video game for being a good kid.. now go play it. I know this is how I felt growing up; my dad always worked and my mom made sure I was doing what I should. There wasn't much love or any actual emotional connection. Your parents are supposed to show you how to love, be a leader, how to experience life etc. However the reality was a more shut off relationship. Personally my dad never did much with me, he was always working. It's sad but true. So when all of these problems add up and reality crashes down on the generation that I live in, some people will snap and do horrible acts like the shooter in CT. I really see a dark cloud approaching for society as these fantasy worlds eventually collapse. Life will sadly play out realistically for the spoiled disney princesses, fake swag kids, video game addictors, and tv addicts. When the realization sets in, I feel like there is going to be massive discomfort and confusion. How are they going to live their lives now since before it was all a fantasy world. Also, the schooling didn't help and our parents lacked in teaching us any real life lessons. This is when I feel that the most sheltered kids living in what society considers the "normal" world will snap. Absolute tragedy that probably could of been prevented. But it makes me question all mankind when something like this happens. It's all black opps to legislate the taking away of guns! The moniker that guns kill people! People kill people not guns! The movie theatre in Colorado has same MO! Once they get our guns, then they tell us all how high to jump and when to jump, or they just shoot you so you no longer can jump! WAKE UP PEOPLE it's evil out there! anthrogirl is new to Captain Cynic and has less than 15 posts. New members have certain restrictions and must fill in CAPTCHAs to use various parts of the site. It's good to know that the youth can see through the bogus, guns don't kill, peope do mantra of the older people. Youth can say the same about drugs. Drugs don't kill, people do. Or you can with all honesty, marijuana doesn't kill, period. So their mantra is illogical. The Chinese guy who couldn't get a gun due to strong gun restrictions stabbed 20+ kids didn't kill any of them, but in the same day in the US, a guy used a gun and slaughtered 20 kids. If that fact alone isn't a wake up call as to how much damage guns can inflict, I don't know what is. Sandy Hook school shooting case was created by the Feds, I have no doubt. A major actor of that case – Robbie Parker’s story reminds me of my experience. In 1994, when my daughter was 6 years old, she lost her three original playmates. They were moved away with their families. Instead of, the Feds supplied three new same age playmates for my daughter. One of them is the daughter of G-man. To fulfill their mission, the Feds would pick up agents fit for their condition. G-man speaks Shanghaies and had a daughter of same age with mine, that’s why he was chosen. Robbie Parker was picked up for same reason. In Sandy Hook case, the Feds need children of age of first grade students. First grade children are new to school. Their families had little chance to know each other. So if there was fraud in case, nobody can prove it. Because they know little about each other. Like G-man, Robbie parker’s family was sent to Sandy Hook particularly for the case. He is not local resident. His original society and community is IN Utah. You can tell it from the following donation announcement. 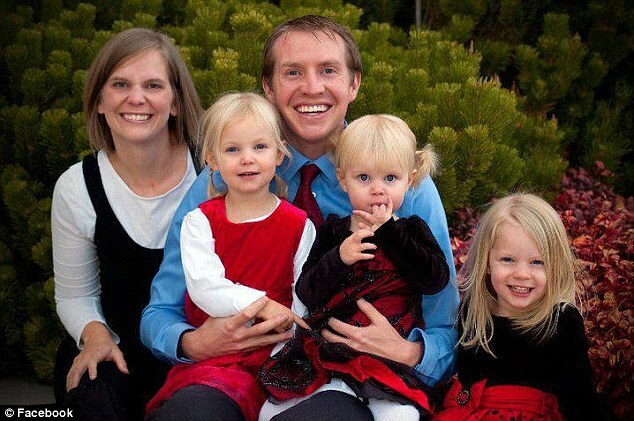 Native of Utah, Emilie Parker was killed in the shooting at Sandy Hook Elem. We are seeking to assist the Parkers by setting up the Emilie Parker Memorial Fund at America First Credit Union in Utah. Robbie Parker was selected not only he has a six years old Emilie but also for he has three look alike daughters. Since 911, more and more people don’t believe the story from government. With Emilie’s “death”, they created another case to discredit “truthers”. katsung47. Sandy Hook was like most elementary schools in the US. The victims started at Sandy Hook in kindergarten so they were not new to the school. It was their second year there. Some of the families of the victims were new to the area and some were long time residents. I'm doubtful of your personal G-man claims but that being said, just because something happened to you does not mean it happened in Newtown. anthrogirl, could you explain why Robbie Parker smiled the day after his daughter's death? No others could do Sandy Hook massacre except the Feds because so many resources were activated: police, media, government officials and informants (some were called as "actors" by people.) And they of course would let out disinformation to meddle the water. Robbie Parker was pushed out as a trap to discredit “Sandy Hook truthers”. Mr. Parker was selected because he has three look alike daughters, all with blonde hair and you can hardly recognize them if they wear same dress. Here is a doctored picture. Madeline and Samantha have no legs in the photo. That part was cut and replaced by other stuff. The two legs on bottom part is from another photo. The size and location does not fit Robbie Parker’s body. 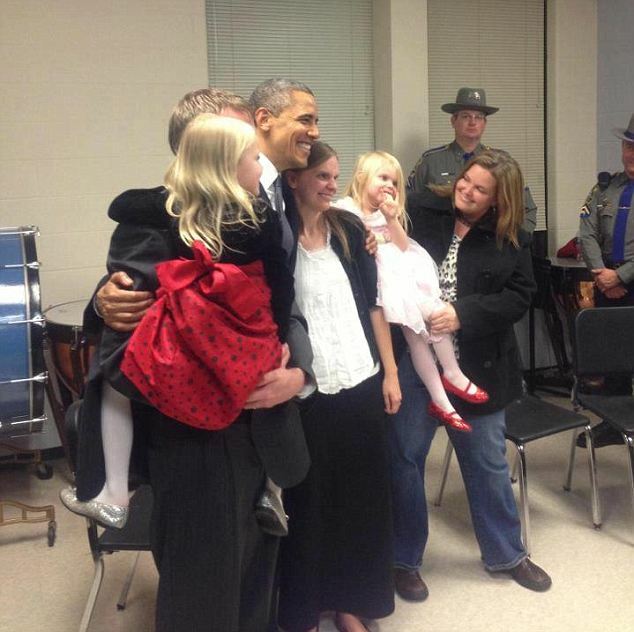 And they deliberately let Madeline wearing Emilie's dress in photo with Obama. Let her have Emilie’s hair style in picture one too. The dress and hair style were designed to confusing people (that Emilie wasn’t dead) then to prove the suspicious people are "conspiracy theorists". Remember, no others have the motive and resource to do that. Those who could take pictures of Obama and Samantha have the privilege even to manipulate president as their actor. This picture was created particularly to mislead people to conclude Emily hadn't died. (they let Madeline wear Emily's dress) That's a trap set up for suspicious people. See how happy those actors are. Are they family members who just lost a lovely girl and after memory service? It’s more like a celebrating party. The original url of the above two pictures were disabled. I post them there to prove how the Feds are afraid of my revelation. When I was a kid, I asked the same thing of my mother when we were at my granthmother's viewiing and I saw my uncle laughing while talking with other adults. My aunt on the other hand was totally without emotion, No laughing, no crying, nothing. She had a deadpan face as if all humanity had been sucked out of her and what was left was a shell. My dad had a third kind of reaction. The night of her death was Christmas eve and we had 5 kids in our family. We all heard him wailing, very loudly, in his room the night she died. My dad had always been the stoic manly man so his expression of grief unnerved us. However, the next morning, Santa arrived with presents for all of us and our cousins who were staying with us while our grandmother was in the hospital. It was a happy time.... at least that's how I remember it. I was around 11 years old. I recall looking at him while I was opening a gift. I know now that his head was swirling with so many things: grief, funeral arrangments, my grandfather, etc but all I saw was his smile and his uncondiotional love for his family. My dad was the rock of the family. He kept it together for all of us even though his pain was very deep. Grief is a complicated thing with many different manifestions. Who are we to judge? My history teacher says school prepares you for working in a factory. It's true: you do the same things everyday, follow a routine, and learn to copy what others around you are doing, and there is one standard for success and that is a grade. He doesn't like that. He wants to make kids actually learn about the world and understand it, and not just copy what people around them are doing. That's why history class was so interesting for us - we weren't just doing textbook work and copying notes, we actually learned things. We discussed whatever had happened recently (like the school shooting, and also not so recently, like 9/11 and other things) and compared it to what had happened in the past. And we never did anything that could be considered "learning" in the most frequently used sense of the word, but we were actually so relaxed that we subconsciously absorbed all the information we needed for the test without even thinking about it (also there are a lot of posters on the wall that have the information on them and you see them so much you couldn't forget any of it). And we learned a lot more than we ever needed for a test. We learned how to think, not work in a factory. Maybe what we need to do is ensure that every kid gets at least one teacher like that per year, and they won't screw up. In January, I read a post about Emilie’s fund raising page. I went there and copied the page content then wrote the following: “Tell me who was so efficient to open a donation account in Credit Union for poor Emily and then set up a page in facebook the same day of her death? They don't want you know the truth. The staffs of the state's top prosecutor and the governor's office have been working in secret with legislative leaders on a law to withhold records related to the police investigation into the Dec. 14 Newtown elementary school massacre. The staffs of the state's top prosecutor and the governor's office have been working in secret with General Assembly leaders on legislation to withhold records related to the police investigation into the Dec. 14 Newtown elementary school massacre — including victims' photos, tapes of 911 calls, and possibly more. The behind-the-scenes legislative effort came to light Tuesday when The Courant obtained a copy of an email by a top assistant to Chief State's Attorney Kevin Kane, Timothy J. Sugrue. Sugrue, an assistant state's attorney, discussed options considered so far, including blocking release of statements "made by a minor."